The 12th World Social Forum took place in Montreal on 9-14 August 2016. The Forum aimed at bringing many people, local or foreign, together to get involved in over 1000 self-managed activities organised in forms which included, according to the official WSF website , ‘the expression of experiences, debate initiatives towards another possible world with opening and closing marches, an agora of initiatives, a youth camp and a wide cultural program’. Apart from being launched in one physical place, the 2016 Forum was open to forum activities outside Montreal and tele-participation through the Internet. 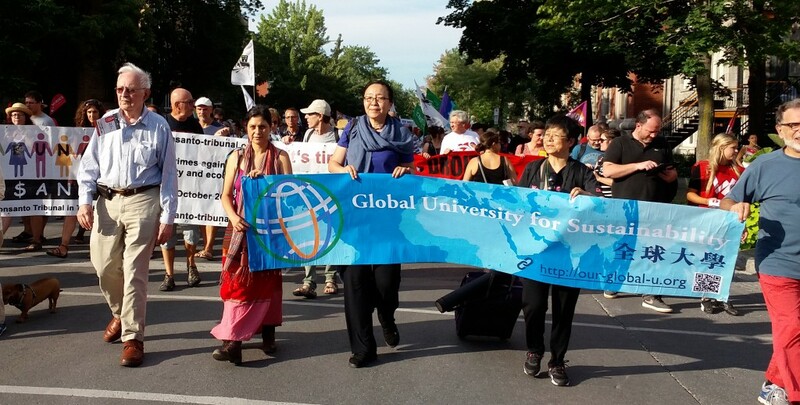 The team of Global University for Sustainability participated in the opening march and organised two activities: Global Dialogue on Sustainability and Mapping China from People’s Perspectives. Emancipation was one important theme-sessionbecause of its emphasis on ways to deal with the current crises and people’s autonomy in making plans for a more sustainable world. Global Social Justice has been working on issues of sustainability. It organized two events at the WSF. Please click here. FSM 2015 J. Berthelot doc E the EPA (456.3 KB) 2016-11-04 Author: Jacques Berthelot. FSM 2015 J. Berthelot doc F les APE (404.9 KB) 2016-11-04 Author: Jacques Berthelot . FSM 2015 Lu on China (43.0 KB) 2016-11-04 Author: Aiguo Lu. FSM 2015 N Sylla déconstruire le discours démocratique (210.0 KB) 2016-11-04 Author: Ndongo Samba Sylla. FSM 2015 P. Bond Afrique du Sud F (393.3 KB) 2016-11-04 Author: Patrick Bond . FSM 2015 SAMIA ZENNADI F RT 4 (26.4 KB) 2016-11-04 Author: Samia Zennadi.